Samsung Galaxy S3 Specs Revealed, Nerd Chills Had. 7 months down the line and I’m still a big fan of my Samsung Galaxy S2. It’s been a great phone, combining large screen size with a slim, lightweight shell that I sometimes have to check for to remind myself that its still in my pocket. It’s surprisingly resilient as well, having taken more than a couple drops from pretty decent heights and coming out the other end with only minor scuffs and nary a scratch on the screen. Sadly I can’t say much more for the battery life as it seems that the more apps I pile on there the worse it gets, but I can’t really blame the phone for my app hoarding ways. I’ll spare you the photoshopped Galaxy S2 images that are doing the rounds but suffice to say those specs are pretty darn amazing. They’re also fairly plausible as well given Samsung’s research into the component technologies and current trends for both carriers and the Android platform. The detail that caught my eye however was the ceramic case as that’s not a material that you’d usually expect to see on a mobile phone with plastic and glass being the only 2 real choices. There could be reasoning behind it though and if my suspicions are correct its due to the crazy amount of tech they’ve stuffed under the hood. Traditionally ceramics are pretty poor heat conductors which is why they make for good mugs and insulation materials. However there are quite a few advanced ceramics that are very capable of moving heat just as efficiently as most metals are, some even better. Now anyone who has a dual core smart phone knows how hot the buggers get when you’re using them for an extended period and since most phones are plastic that heat tends to stick around rather than dissipate. The ceramic case could then be an attempt to mitigate the heat problems that will come with the quad core processor and larger screen. This also has the potential to make the phones somewhat more brittle however (ceramics don’t flex, they shatter) so it will be interesting to see how Samsung compensates for that. With just those few details though I’m already excited for Samsung’s next instalment in their flagship line of smart phones. Their last 2 iterations of the Galaxy S line have gone from strength to strength, firmly cementing themselves as the number one Android handset manufacturer. The Galaxy S3 looks to continue this trend with specifications that are sure to tempt even the most recent purchasers of the S2. I know I’ll find it hard to resist and I’m thankful that it probably won’t be out for a little while longer. Let’s Get Moore’s Law Straight, Ok? Anyone who’s had a passing interest in computers has likely run up against the notion of Moore’s Law, even if they don’t know the exact name for it. Moore’s Law is a simple idea, approximately every 2 years the amount of computing power than can be bought cheaply doubles. This often takes the more common forms of “computer power doubles every 18 months” (thanks to Intel executive David House) or, for those uninitiated with the law, computers get obsoleted faster than any other product in the world. Since Gordon E. Moore first stated the idea back in 1970 it’s held on extremely well and for the most part we’ve beaten the predictions pretty handily. Of course there’s been a lot of research into the upper limits of Moore’s Law as with anything exponential it seems impossible for it to continue on for an extended period of time. Indeed current generation processors built on the standard 22nm lithography process were originally thought to be one such barrier, because the gate leakage at that point was going to be unable to be overcome. Of course new technologies enabled this process to be used and indeed we’ve still got another 2 generations of lithography processes ahead of us before current technology suggests another barrier. Transistors — the basic building block of the complex electronic devices around you. Literally billions of them make up that Core i7 in your gaming rig and Moore’s law says that number will double every 18 months as they get smaller and smaller. Researchers at the University of New South Wales may have found the limit of this basic computational rule however, by creating the world’s first single atom transistor. A single phosphorus atom was placed into a silicon lattice and read with a pair of extremely tiny silicon leads that allowed them to observe both its transistor behavior and its quantum state. Presumably this spells the end of the road for Moore’s Law, as it would seem all but impossible to shrink transistors any farther. But, it could also points to a future featuring miniaturized solid-state quantum computers. It’s true that this seems to suggest an upper limit to Moore’s Law, I mean if the transistors can’t get any smaller than how can the law be upheld? The answer is simple, the size of transistors isn’t actually a limitation of Moore’s Law, the cost of their production is. You see most people are only familiar with the basic “computing power doubles every 18 months” version of Moore’s Law and many draw a link between that idea and the size of transistors. Indeed the size is definitely a factor as that means we can squeeze more transistors into the same space, but what this negates is the fact that modern CPU dies haven’t really increased in size at all in the past decade. Additionally new techniques like 3D CPUs (currently all the transistors on a CPU are in a single plane) have the potential to exponentially grow the number of transistors without needing the die shrinks that we currently rely on. So whilst the fundamental limit of how small a transistor is might be a factor that affects Moore’s Law it by no means determines the upper limit; the cost of adding in those extra transistors does. Indeed every time we believe we’ve discovered yet another limit another technology gets developed or improved to the point where Moore’s Law becomes applicable again. This doesn’t negate work like that in the linked article above as discovering potential limitations like that better equips us for dealing with them. For the next decade or so though I’m very confident that Moore’s Law will hold up, and I see no reason why it won’t continue on for decades afterward. 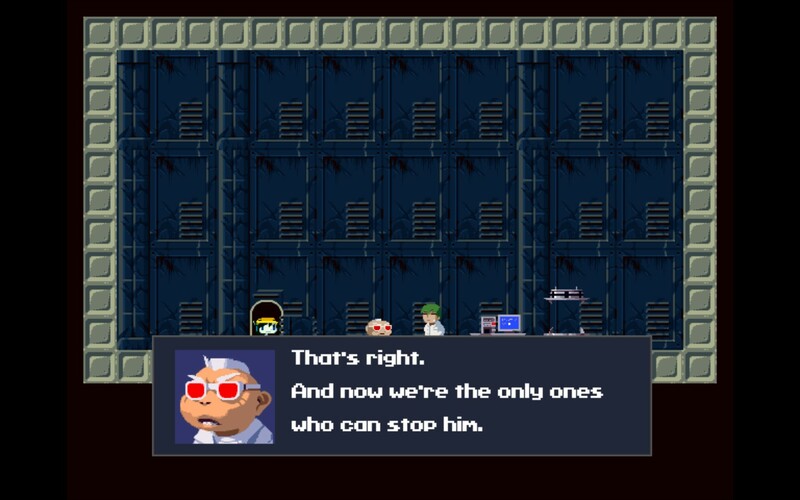 Cave Story+: Robots, Rabbits and Rivals. 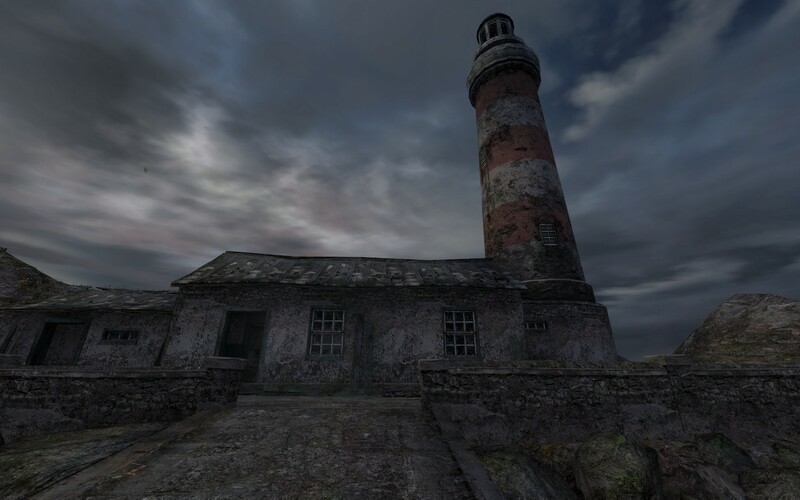 The last few years have seen many independent developers attempt to expand on the traditional platformer style, usually either by re-imagining the concept or by combining it with elements that are common place amongst more modern games. Few however attempt to make a platformer that wouldn’t be out of place with its ancestors, in both regards to game play and graphics. Cave Story+ is one of those rare few, being first released over 7 years ago makes it even rarer as there was nary an indie scene to speak of, and it’s recent re-release on steam (and inclusion in the Humble Bundle) has seen it meet many more eyeballs, including my own. Without so much as little bit of back story or title sequences explaining things you’re dumped straight into the game. You, although you’ll only find this out as you work your way through the game, are an amnesiac robot who’s managed to find himself in the middle of a plot being hatched by someone simply referred to as the Doctor. His plot seems to revolve around the native inhabitants of the area called the Mimiga, a race of humanoid rabbit looking folk. You then dive into the various sections of the world in order to help out the Mimiga and hopefully foil the plot of the Doctor. I hate to start off the review with a criticism like this but the absence of some form of a tutorial makes the first hour or so (and some sections later on) with Cave Story+ a little frustrating. Whilst the arrow keys control movement the jump button isn’t up or space (it’s x) and fire is z. This wouldn’t be too much of a problem, I’d just check the options menu I hear you say, well unfortunately that’s not accessible once you start playing the game. You’ll have to quit to the main menu in order to be able to view the key bindings. It’s a shame really as this game has gone through several revisions since it was first released and I can’t be the only one who thought this wasn’t ideal, so my mind boggles as to why it’s still that way. Cave Story+ does get points though for having art work that would not be out of place in games that were almost a decade its senior. Whilst there’s no real evocative mood along the lines of other recent pixelart games like Gemini Rue and To The Moon the artwork does a good job of paying homage to the games that inspired it. My only complaint about it would be that it’s sometimes hard to tell which things are meant to be interactive and which things aren’t, although to be fair that was true of the games that Cave Story+ seeks to emulate and is probably intentional. Like it’s ancestors Cave Story+’s story is driven by the good old fashioned wall of scrolling text. There’s a good amount of dialogue in Cave Story+ as well, enough so that the back stories of each character get filled out well enough that you can understand their motivations in the story. This makes up somewhat for the beginning’s complete lack of information and confusing switching between you and another character. One annoying part though was the limited way in which to skip dialogue. You can hold down the enter key to make it scroll faster but you’ll have to hit it again every time they reach the end of their section of dialogue. This wouldn’t be too bad but there are some sections where you’re required to make a choice, and with the default always being “Yes” this means that it’s quite easy to make a wrong choice at a point (as I did a few times). You can reload to do it again, but there’s also the issue with that as should you fail at a section and restart at your last save point you’ll have to go through all the dialogue again, even if there are no choices to be made. 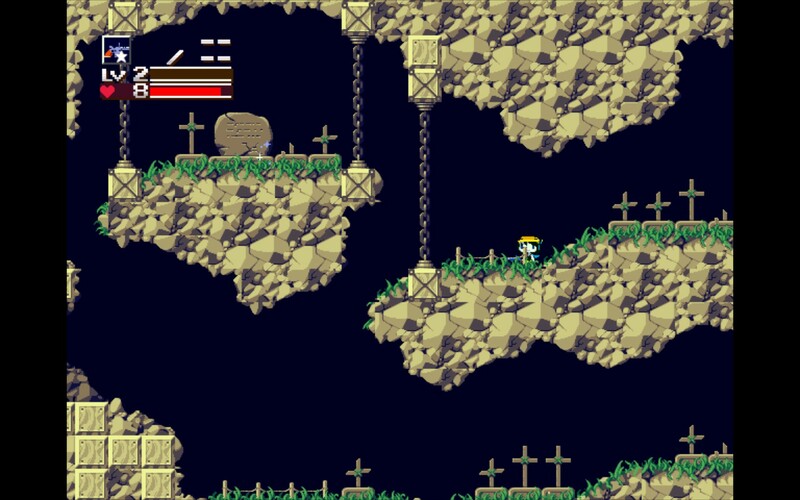 Combat in Cave Story+ though is surprisingly inventive, varied and above all fun. Whilst you start out with only a single gun, what appears to be a Revolver named the Polar Star, your arsenal quickly expands to multiple weapons. Each of the weapons has their own unique ability, like bouncing balls of fire or a gun that blows protecting bubbles around you, and depending on your situation there will be a weapon that’s ideal for that particular engagement. This is what makes Cave Story+ so appealing, but it doesn’t stop there. As you defeat enemies they drop little glowing triangles and collecting these will level up the weapon you currently have equipped. Each weapon changes significantly as it progresses through the levels and at the final level they usually have some kind of added bonus that makes them really worth while. My weapon of choice was the Machine Gun as it’s level 3 ability is to be able to push you upwards if you fire it downwards, making the platforming sections much easier and a lot of fights trivial. This is followed in close second by the sword which functions as an area of effect weapon at its highest level and is particularly devastating against bosses. The weapon system also plays a heavy part in the strategies that you’ll form as you go through Cave Story+. You see when you get hit both your life and current weapon level will go down and depending on the weapon this can mean an instance de-level (like with the sword). For some boss fights then, when its impossible to not get hit, switching between the appropriate weapon and another one you don’t care about can mean the difference between beating the boss easily or stumbling your way through with the wrong weapon for the job. It’s immensely satisfying and is undoubtedly why Cave Story+ has a following like it does. As for the overall story itself I could take it or leave it as there’s nothing particularly memorable about any of the characters which I’d say is due to the limited amount of dialogue in it. Sure there’s enough to keep the story going but after being spoiled with great stories recently, even ones without dialogue, I can’t help but feel that Cave Story+ doesn’t deliver in the story department. I’m putting myself at odds here with the greater community who commend Cave Story+’s err story but I stand by my comments. Despite all these difficulties though Cave Story+ is still at its heart very fun to play. I didn’t catch myself wondering why I was playing this game, questioning whether or not I was doing it just for the review, which speaks volumes to Cave Story+’s game play. If you’re a fan of the old school style platformers then Cave Story+ is right up your alley and even if you’re not it still stands on its own as a really enjoyable game, even if it suffers from some solvable problems. Cave Story+ (or some form of it) is available right now on PC, OSX, WiiWare and DSiWare right now for $9.99, $9.99 and some amount of Nintendo points. Game was played entirely on the PC on the Easy difficult setting with around 5 hours played and 45% of the achievements unlocked.